Nikon’s new S7000 compact is aimed at the point-and-shoot holiday photographer who wants a versatile zoom range in an easily portable package. The headline feature of the S7000 is its generous 20x optical zoom, which equates to 25-500mm in 35mm terms. There’s a 20 million pixel back-illuminated CMOS sensor, full HD video recording, which is pretty much standard these days, along with Wi-Fi and NFC connectivity, which are becoming increasingly common. Rounding out the spec list is a range of scene modes, a three-inch 460k-dot LCD screen and an EXPEED C2 processor. The S7000 slips comfortably into a pocket or small bag, and Nikon has gone with a fairly standard design and construction, with the control buttons grouped at the right hand side. There’s a mode dial on the top of the camera, and while there are no manual or semi-automatic exposure modes there are still a couple of things you can change when using Auto mode, including white balance and sensitivity, via the main menu. When shooting in Effects mode you need to open the main menu every time you want to choose a new effect, which is a bit of a faff – it would be a nice if you could do this using a quick menu or function button. Connecting the camera to your smartphone or tablet over Wi-Fi is reasonably quick and easy, but it’s a shame you can’t control a greater range of functions, aside from zooming the lens and firing the shutter, from the companion app, which you can download for free. The app is useful for capturing selfies and group shots though, and if you have an NFC-enabled device the connection setup is even quicker, as you simply tap the two devices together. You can set the autofocus point manually on the S7000, which is a rare and welcome feature for a compact camera at this level. To do so you first need to select Manual under AF area mode in the main menu, then press the OK button in the centre of the navigation pad and scroll to the desired point using the directional keys. As you’d expect for a camera with a small sensor, the S7000 performs best in good light. Colours are lovely and vibrant, and accurate too, which is pleasing to see – we’ve noticed cyan-like skies with some previous Nikon compacts, but happily that doesn’t seem to be the case here. In general, detail is well rendered: if you zoom in to 100% you’ll see some image smoothing at every sensitivity setting, but this is no worse than with other compact cameras of its kind – and most viewers won’t be subjecting your images to such close scrutiny. Shooting at higher sensitivities, such as ISO 800 or 1600 leads to more noticeable loss of detail, but the trade-off is that noise is kept to a minimum and the overall impression of detail is still good, especially when images are viewed at normal print and web sizes. You can’t change the metering mode, but the automatic setting does a reasonable job of producing accurate exposures without too much need for exposure compensation, other than when you’re shooting in very high contrast conditions. The auto white balance system also performs well, producing accurate colours in the majority of situations, including under artificial lighting. Detail is well rendered throughout the lens’s optical zoom range. The digital zoom is a different matter: it’s best avoided, unless you’re desperate to get especially close to a subject, as there’s a noticeable drop in image quality. The 20x optical zoom is enough to cover most bases, and makes the camera ideal for walkabout travel and street photography. 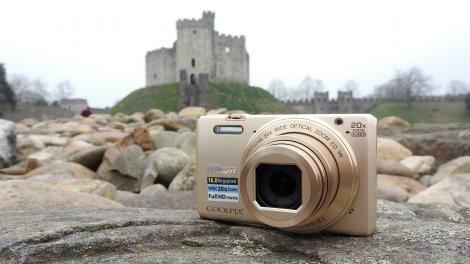 And unlike some other 20x optical zoom offerings the camera is also nice and slim, and fits comfortably in your pocket. It would have been nice to see a touchscreen, as it’s likely that S7000 users will also be smartphone users. Offering a neat little package for your money, the S7000 performs well and boasts some useful features that will appeal to those looking for a simple family or holiday camera. While you can’t take full manual control, the 20x optical zoom is a great asset, and the camera is capable of producing shots that look good, especially if they’re taken in decent lighting. The inbuilt Wi-Fi is easy to use, if a little limited in its functions, while the Effects mode enables you to add some fun and funky treatments to your images if you like that sort of thing.